Slinger High School’s Vocal Jazz is an auditioned a cappella group that consists of 20 female vocalists who are directed by Mrs. Peters. 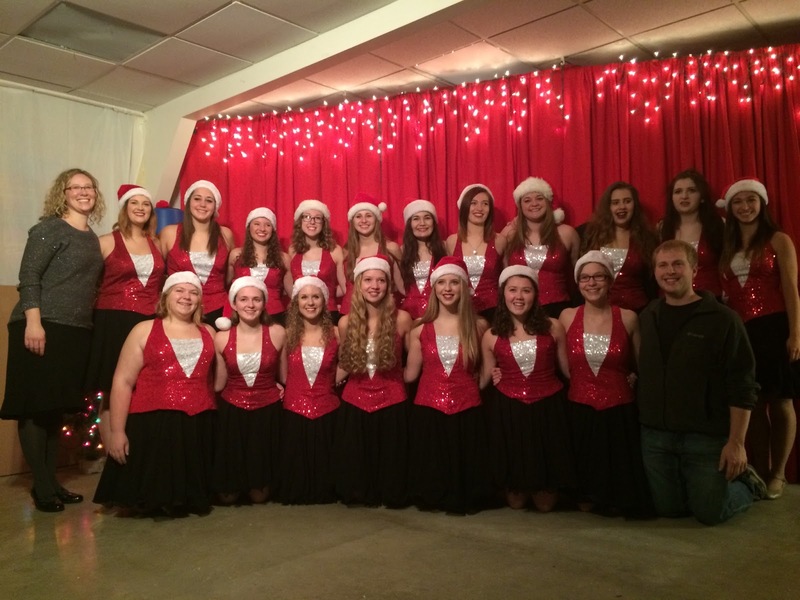 The holiday season is a special time for the Vocal Jazz girls, and it is also their busiest time of the year. They began rehearsing their Christmas set-list in late August to get a head start on learning songs and memorization. During the weeks of December that lead up to Christmas, Vocal Jazz performs a half hour holiday set at many gigs scheduled all around the community. The songs include traditional Christmas songs, holiday classics, and a few more modern pieces. This winter, the girls are scheduled to give 12 performances. They have already performed at the tree lighting celebration at Hartford Hospital and were featured on 104.9 WTKM, the tree lighting at Community Park, the Festival of Trees, Cedar Community’s Christmas party, Autumn Oaks, Serenity Villa, and the Lion’s Club meeting. With their sparkling red tops, Santa hats, bright faces, and warm voices, the girls in Vocal Jazz enjoy spreading the happiness of the holidays through their voices. These gigs are an excellent way for them to give back to their community while also showing off their hard work. Everyone is invited to attend the Christmas choral concert on December, 16 at 7:30 in which Vocal Jazz will be singing two selections from their holiday repertoire. Senior Vocal Jazz girls will be combining with Men’s A Capella to perform a special song there as well. All are also welcome to stop in and listen to Vocal Jazz perform at Enchantment in the Park in Regner Park at 6:30 on December, 20. It is held indoors at the Pavilion, snacks and hot chocolate are available, and Santa often makes an appearance as well. Between the lights and decorations, all in attendance will truly feel like they are “taking a stroll down Candy Cane Lane,” as the Vocal Jazz girls sing about in one of their favorite new songs.